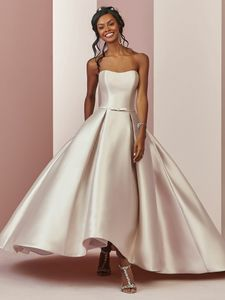 Description: This Reena Mikado wedding dress features a strapless scoop neckline, box pleats, and pockets in the high-low ballgown skirt. An attached Reena Mikado belt adds a touch of whimsy to this romantic style. Finished with covered buttons over zipper and inner elastic.